Relocating your entire lifetime of possessions is a very big deal. There’s always the chance your situation may change and you need to return home. Often, we relocate clients that are still in the process of finding a house at their destination and they’re unsure what size their new living quarters are likely to be. In this situation, it’s worthwhile considering our storage facility - short or long-term. Fully alarmed and monitored by Chubb Security, our vermin-proof warehouse – located at 33-35 Atiawa Street, Glen Avon, New Plymouth - has been divided into separate modules for each consignment. Recently renovated, our facility has new steel cladding and was reroofed in 2008. Fortunately, due to the location of our warehouse, we’re very sheltered from the windy and dusty elements and we’re well protected from those strong south-easterlies. We can assure you, if you choose to place your possessions into our facility, your belongings will remain extremely secure in our care. We only offer a static storage solution, which means that once your consignment is stowed away safely into your own bay, we will not move your belongings again - not until you ask us to deliver them. Other removal companies often use a mobile storage system. This is where your consignment is loaded onto a wooden crate, then moved around the store via a forklift. If the items are stored incorrectly, there’s always the chance of damage. 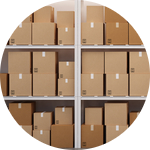 Using our static storage solution means your precious possessions are kept ultra-safe at all times. In all cases, before we load your effects from residence to store, we take inventory of all items so you’ll have an exact list of what’s safely stowed. This is also incredibly useful for financial and insurance purposes. If you’re looking for storage facilities nationally or overseas, we can help there too. We have many global connections and an agency agreement with Allied Pickfords – the largest, most recognised removals company in the world with almost 400 years of experience - so we are more than happy to help with this.